AzhwAr talks about how emperumAn carries out the activities for dhEvathAs who desire other benefits [and not emperumAn]. emperumAn – Oh our lord! iRai – Oh supreme being! iRai emperumAn aruL enRu – Oh supreme being for the world and our ordained Lord! Show us mercy. iRai emperumAn aruL enRu – Just as it is mentioned in thiruvAimozhi 2-2-10 “kaLvA! emmaiyum Ezhulagum ninnuLLE thORRiya iRaiva! ” (Oh the mischievous lord who created us and all the worlds within you! Oh our lord!) the dhEvathAs will worship emperumAn. aruL enRu – if the people living in the town find that one of their belongings has been stolen, they will assemble at the house of the head of the town who protects them and cry out about the loss of their property/possession. In the same way, these dhEvathAs will also come to emperumAn who is their protector and plead with him if their possessions / lands are taken away by demons such as rAvaNa et al. 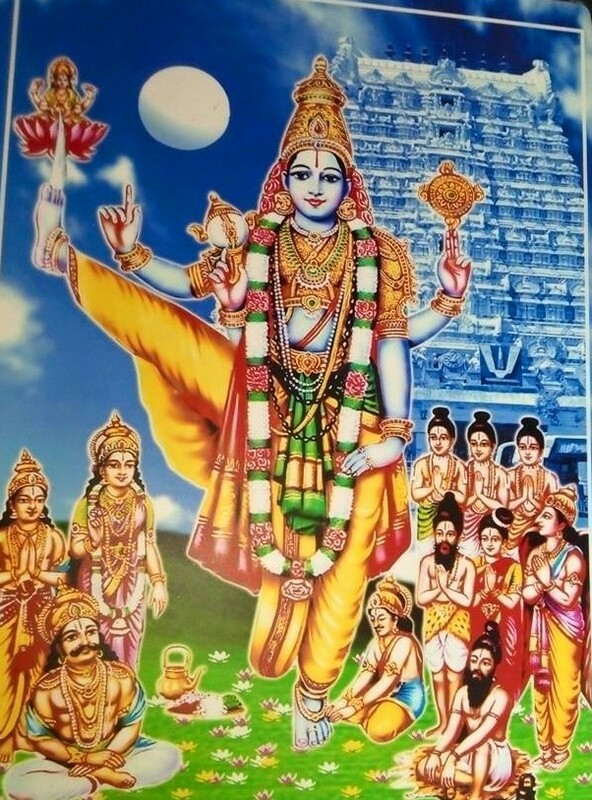 Who are these people who come and pray…..
imaiyOr – these are the people mentioned by nammAzhwAr in his thiruvAimozhi 2-2-10 as “veLLERan nAnmugan indhiran vAnavar ” (dhEvathAs such as rudhra, brahmA, indhra et al); they are the people, who have their own worlds, vehicles, flags, weapons etc [granted by emperumAn] and who, blowing their own trumpets, will call themselves as ISvarOham (I am the Lord). AzhwAr says that they leave aside their ego and trumpets and come and pray to emperumAn. muRai ninRu – they will know that emperumAn is the lord and that they are the servitors, and holding their hands together, will bow down to emperumAn. moymmalargaL thUva – just as their followers worship them with beautiful flowers, these dhEvathAs will worship emperumAn with beautiful flowers. thUva – in their anxiety that whatever they have prayed for now should be granted , they will sprinkle the flowers, not at the divine feet of emperumAn but haphazardly on his head. What does emperumAn do when they worship him like this? aRai kazhala sEvadiyAn – emperumAn who stands with his warrior’s anklets sounding reverbrantly on his divine feet. Even as they are praying, he gets ready to do their bidding. kazhal is indicative of all other ornaments worn by him on his divine feet. sengaN nediyAn – one who has lotus like eyes, indicative of the fact that he is the lord for all these dhEvathAs, as mentioned widely in sacred texts – SvEthAsvathara upanishath says of emperumAn “tham ISvaraNAm paramam mahESvaram tham dhEvathAnAm pramamcha dhaivatham ” (he is the mahESvaran for all these ISvarars and he is the dhEvathA for all these dhEvathAs). nediyAn – he is the greatest among all. mAl – even though they come to him for helping them with lowly benefits, he doesn’t frown at them but showers affection on them like water flooding the channels once the sluice gates are opened in a lake. He is affectionate towards them in the hope that at some point of time in the future, they will come to him, asking for himself instead of such lowly benefits. Did he not lower his status while carrying out their tasks! kuRaL uruvAy – the opinion is that in order to carry out the task for such followers, he did not take a great form consistent with his greatness of giving everything to others, but took the form of a dwarf (vAmana) for whom taking alms from others is the ordained duty. mAvadivil maNkoNdAn – he took a huge form [after being granted his wish by mahAbali] capable of swallowing all the worlds, in order to measure the worlds [and get back what his followers had lost]. kuRaL uruvAy mAvadivil – Just as thirumazhisai AzhwAr mentioned in his thiruchchandha viruththam 109 “surukkuvAinRiyE surunginAy surungiyum perukkuvArai inRiyE perukkameydhu peRRiyOy ”, he dwarfed himself and grew to very large extent of his own volition, without anyone asking him to do so. We shall take up the 100th pAsuram next. This entry was posted in iraNdAm thiruvandhAdhi, iyaRpA on February 19, 2018 by T N Krishnan. AzhwAr enjoys the activities of the one who blessed him with his grace. He says that if one were to look at the way emperumAn, who controls all the worlds, blends freely with a lowly samsAri such as himself, this would also appear to be one of those great activities of emperumAn. It can also be said that AzhwAr is saying that just as world cannot exist without emperumAn, emperumAn also cannot exist without him. kOvalanAy – the supreme being, emperumAn, came in the clan of cowherds who do not know the difference between left hand and right hand [they are so ignorant]. mEvi – fitting well into that clan. When he was asked by the cowherds, after seeing his superhuman activities (including lifting the gOvardhana hill for seven days to protect them and their cattle), he said, as mentioned in SrI vishNu purANam 5-13-13 “nAham dhEvO na gandharvO na yakshO na rAkshasa: I aham vO bAdhavO jAtha: naichinthyamithO’nyathA: II” (I am not a dhEva or gandharva or yaksha (all these three are different types of celestial beings) or rAkshasa (demonic clan). I was born as your relative; you should not think in any other way). He affirmed that he is one among the cowherds since he fitted so well in their clan. kudam koNdu Adi – being born in the clan of cowherds, he danced their traditional dance with pots. Dancing with pots on their hands and heads is typical of cowherd people. kudamAdi en nenjam mEvi – AzhwAr says that even as krishNa came dancing in the street with pots, seeing the involvement of AzhwAr in his activity, he entered the heart of AzhwAr and carried on with the dance in his heart. uLLodunga uNdadhu ulagEzhum – what he ate as an infant, and which would occupy a small corner of his little stomach, were all the worlds! AzhwAr is amazed at this activity of the infant swallowing all the huge worlds, making them rest in a corner of his stomach and lying on a tender banyan leaf. Ezhulagam is indicative of all the worlds in samsAram. We shall take up the 99th pAsuram next. This entry was posted in iraNdAm thiruvandhAdhi, iyaRpA on February 18, 2018 by T N Krishnan. AzhwAr says that in order to bless him, emperumAn came to thirukkudandhai and took a reclining position, as a simple entity. 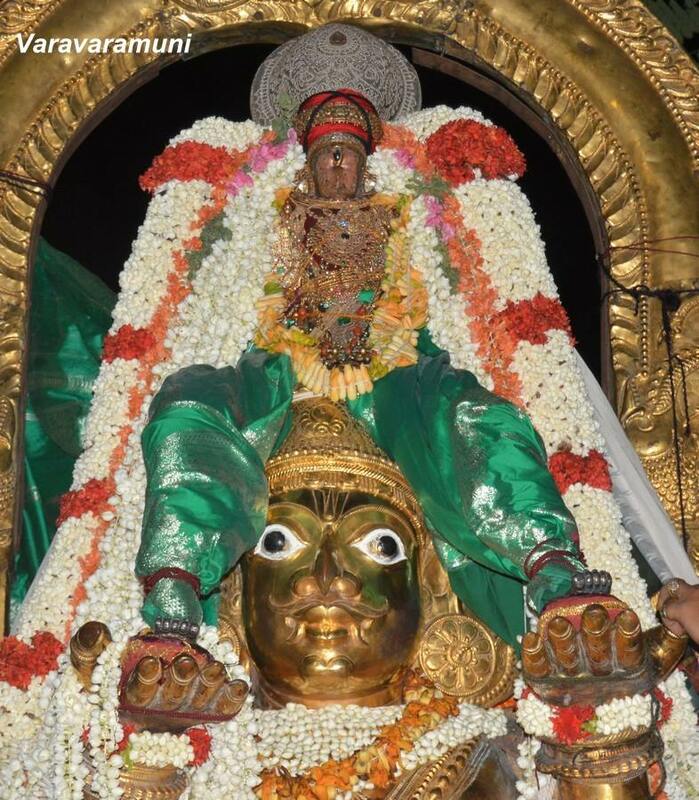 thirumArbA – Oh one who has periya pirAtti (SrI mahAlakshmi) on his chest! thirumArbA – Oh one who has thiru (SrI mahAlakshmi) on his chest! The opinion here is that the primary reason for emperumAn to have us as his servitors is the recommendatory role played by pirAtti. AzhwAr is thinking of the first part of dhvaya mahAmanthram. parASara bhattar in his SrI guNarathna kOSam 44 had said “vEdhAnthAs thathvachinthAm murabhidhurasi yathpAdhachinhaistharanthi” (vEdhAnthas (upanishaths) bring to an end the discussion about who is the supreme being by looking at the identification marks of pirAtti’s divine feet on the chest of murAri (emperumAn, the killer of mura)). In the same way, purusha sUktham in uththara bhAgam has said “hrIScha thE lakshmIScha pathnyau” (SrIdhEvi and bhUmidhEvi are your consorts). Thus emperumAn’s supremacy was established through his connection with his consorts. 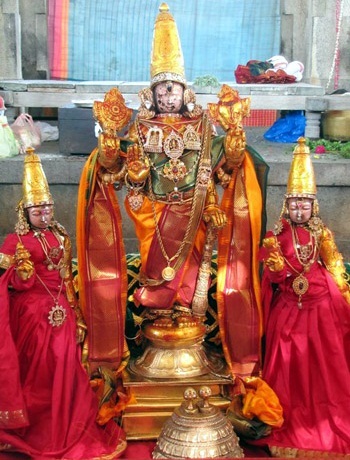 imaiyOr thalaimgan – nammAzhwAr says in thiruvAimozhi 1-1-1 “ayarvaRum amarargal adhipathi” (he is the lord of nithyasUris who do not forget anything). rig vEdham says “thadhvishNO: paramam padham sadhA paSyanthi sUraya: ” (nithyasUris constantly keep looking at that great dwelling place of vishNu). The opinion in both these is that he is the supreme entity, being the lord of nithyasUris. Next, AzhwAr enjoys the divine eyes of emperumAn with which he has enslaved the nithyasUris. sengaN nedumAl – chAndhOgya upanishath 1-6-7 says “thasya yathAkapyAsam puNdarIkam Evam akshiNI ” (there are two divine eyes for the supreme entity, which are like lotuses blossomed by sun). nedumAl – very great entity. The opinion here is that it is clear that he is the supreme entity who is referred to by vEdhAntham (upanishath) going by his divine eyes. engaL perumAn – “to be our lord” is the opinion of appiLLai (one of the vyAkhyAthas for this dhivya prabandham) while periyavAchchAn piLLai as well as nampiLLai take it as an exclamatory (calling out) part. nI – you, who are having such greatness as well as simplicity. pAmbaNaiyin mEl sErndhAy is supposed to be its continuation. kudamUkkil kOyilAyk koNdu – having the divine abode thirukkudandhai as his temple. kudamUkku il refers to the region of thirukkudandhai. pongu pada mUkkin AyiravAyp pAmbaNai mEl sErndhAy – the well spread out hoods which AdhiSEshan has due to contact with emperumAn, and his noses as well as his thousand tongues with which he is ready to praise emperumAn due to the resultant happiness. emperumAn is reclining in a divine manner on such AdhiSEshan. periyavAchchAn piLLai’s opinion is that apart from blessing us in standing posture at thiruvaththiyUr [previous pAsuram], emperumAn has taken position in thirukkudandhai in reclining posture with a vow that he will not get up until he uproots samsAram, with his greatness and simplicity. appiLLai’s opinion is that just as he enslaved us showing his beauty in thiruvaththiyUr, he enslaved us showing his beauty in thirukkudandhai. We shall take up the 98th pAsuram next. This entry was posted in iraNdAm thiruvandhAdhi, iyaRpA on February 16, 2018 by T N Krishnan. AzhwAr says that the one who liked him is the lord of both leelA vibhUthi (materialistic realm) and nithya vibhUthi (spiritualistic realm). aththiyUrAn puLLai UrvAn – one who has garuda as his vehicle. Sri kUraththAzhwAn divinely mentions in his varadharAjasthavam 25 “AdhirAjayamadhikam bhuvanAnAmISa thE bhiSu nayan kila mouLi:” (Oh Lord, your crown gives out the fact that you are the lord of all the worlds!). Being the indwelling lord of thiruvaththiyUr and having the vEdhasvarUpi (one who manifests vEdhas) garuda as his vehicle would indicate that he is the supreme being. puLLai UrvAn – Just as it is mentioned in thiruvAimozhi 1-8-1 “Odum puLLERi”, only he who rides on garuda and controls the worlds can be the supreme entity. aNi maNi in thuththi sEr nAgaththin mEl thuyilvAn – he reclines on thiruvananthAzhwAn (AdhiSEshan) who is decorated with carbuncles and has beautiful hoods. aNimaNi means beautiful gems. It refers to carbuncles worn beautifully by AdhiSEshan. in thuththi refers to the identification on the beautiful hood. sEr refers to AdhiSEshan having the beauty to be appropriate as the mattress for emperumAn since he has gems and identification on his beautiful hoods. nAgaththin – thiruvananthAzhwAn has all the qualities of being the mattress for emperumAn – softness, fragrance, coolness etc. mEl thuyilvAn – it is evident that one who has such AdhiSEshan as his mattress is the supreme being. Didn’t kaushIthaki upanishath say “amithaujA: paryanka: thasmin brahmA AsthE” (ananthan who has excessive strength is the mattress; brahmam (supreme being) resides on top of that mattress)! muththI maRaiyAvAn – vEdhas talk about the three types of agnis (ritualistic fire) gArhaspathyam, AhavanIyam and dhakshinAgni. 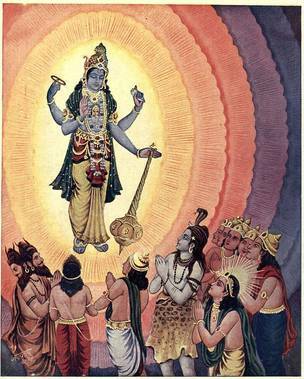 emperumAn is worshipped by the vEdhas with the three agnis. Unlike other purANas and Agamas which were created by people, vEdhas haven’t been created by anyone [they are called as apaurashEyam, not created by any purusha or soul]. Thus, while the other purANas and Agamas may talk about other deities also, vEdhas have affirmed emperumAn as the supreme being. If the text is taken as muththi maRaiyAvAn, it will indicate that emperumAn is affirmed as the means for attaining mOksham (liberation) by the upanishath part of vEdhas. 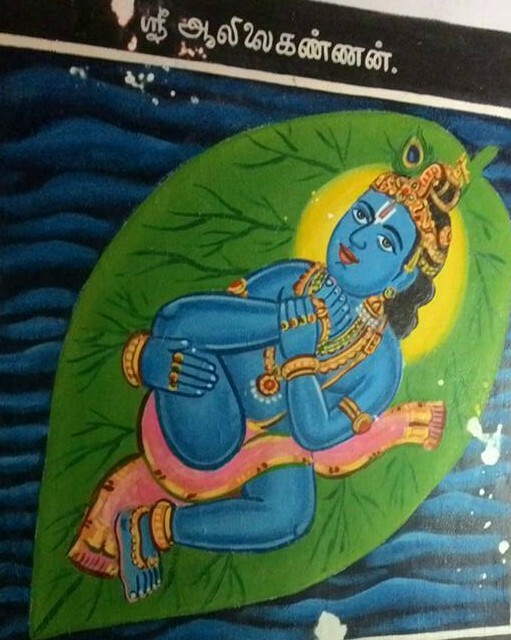 mA kadal nanjuNdAn thanakkum iRaiyAvAn – emperumAn is the ISvaran (one who controls) for rudhra who drank the poison which came first when the big ocean was churned (for obtaining nectar) and due to which , out of ego, he called himself as ISvaran. rig maNdalam 10, sUthram 136-7 says “kESa vishasya pAthrENa yadhrudhrENa apibadh saha” (kESava, who has beautiful locks of hair, drank the poison along with rudhra, who was a container for that poison). rudhra, who goes around saying that it was he who drank the poison, was just a vessel and was it not emperumAn, who as his antharyAmi (indwelling soul of rudhra) drank that poison! By saying puLLai UrvAn……nAgaththin mEl thuyilvAn which includes nithyasUris garuda and AdhiSEshan, emperumAn’s lordship over nithyavibhUthi has been indicated. By saying mA kadal nanjuNdAn, rudhra, the head of samsAris, was referred, thus indicating emperumAn’s lordship over leelA vibhUthi. Since maRaiyAvAn was mentioned in between these two sets of words, it was indicated that vEdha has affirmed his lordship over both the vibhUthis. AzhwAr says next that emperumAn, without considering his superiority, came to thiruvaththiyUr in order to help us. engaL pirAn aththiyUrAn – hasn’t such an emperumAn come to thiruvaththiyUr in order to help us! By saying “en nenjamEyAn en senniyAn” AzhwAr says that emperumAn, apart from having affection towards him, came to hasthigiri (sanksrit name for thiruvaththiyUr) to help all those who are connected to him either directly or through lineage. We shall move on to the 97th pAsuram next. This entry was posted in iraNdAm thiruvandhAdhi, iyaRpA on February 14, 2018 by T N Krishnan. AzhwAr says that emperumAn who is the reason for the creation of all the worlds and is the refuge for all the worlds entered all the parts of his body, from his dwelling place at thiruvaththiyUr (kAnchipuram). He talks about how he exists without knowing anything other than emperumAn. en nenjam mEyAn en senniyAn – once AzhwAr’s heart liked emperumAn, emperumAn made himself present in all the parts of AzhwAr’s body. Even as AzhwAr kept one part of his body with emperumAn, he entered all the parts of AzhwAr’s body. en nenjamEyAn en senniyAn – he is inside my heart. nammAzhwAr too has mercifully mentioned in thiruvAimozhi 10-6-6 “thalaimEla thALiNaigaL thAmaraikkaN ennammAn nilaipErAn ennenjaththu eppozhudhum” (my Lord, emperumAn, with lotus eyes, will never leave my heart once he keeps his divine feet on my head). dhAnavanai vannenjam kINda – he tore the strong heart of iraNiyan who proclaimed himself as God. van nenjam – iraNiyan had a heart which had no compassion either towards emperumAn or his followers. He had a heart which will not hesitate to carry out a disrespectful deed towards emperumAn or his followers. Even when he saw the fearful form of narasimha, his heart did not soften. One can even assume that it was so hard that even chakrAyudham (emperumAn’s divine disc) could not crack it open. maNivaNNan – emperumAn has a form which removes fatigue, with the happiness that with iraNiyan destroyed, the enemy of prahlAdha had been destroyed. This implies that emperumAn’s form is like a blue coloured gem, being very soft and great. munnam sEy UzhiyAn – Just as it is mentioned in chAndhOgya upanishath “sadhEva sOmya idham agra AsIth” (Oh child, this existed even before creation), emperumAn had both chith and achith (sentient and insentient entities) in subtle form, as his body, even before creation, when the world had been destroyed and they were waiting for their time. We can also construe this as emperumAn who was present even at the time of deluge, preparing for creation. Uzhi peyarththAn – He destroyed them [the worlds]. He destroyed them since he did not get the benefit out of creating them. As the time approaches, it is he who destroys too. Uzhi peyarththAn – it can also be taken that it was emperumAn who created everything indicated by time. ulagEththum AzhiyAn – he reclines in thiruppARkadal (milky ocean) in the form of anirudhdha, to be worshipped by everyone. Or, it can be construed as emperumAn who is holding the divine disc, to be worshipped by everyone. aththiyUrAn en nenjamEyAn – thiruvaththiyUr is just like thiruppARkadal. We shall take up the 96th pAsuram next. This entry was posted in iraNdAm thiruvandhAdhi, iyaRpA on February 12, 2018 by T N Krishnan. AzhwAr tells us that before we attain hell we should worship emperumAn who has unlimited sweetness and who removes our enemies. kadidhu kodu naragam – the cruel hell will be horrible even to look at. piRkAlum seygai kodidhu – the activities there will be even more horrible. The followers of yama will indulge in activities such as throwing people in a river of blood, throwing them over grass which will be sharper than sword etc. piRkAlum seygai kodidhu – more than seeing hell, seeing their activities there will be even more horrible. Their [followers of yama] grotesque forms will be terrible to look at. piRkAlum means on top of that. Have the cruelties in hell not been mentioned in periyAzhwAr thirumozhi 4-5-7 “thennavanthamar seppamilAdhAr sEvadhakkuvAr pOlap pugundhu pinnum vankayiRRAl piNiththeRRip pin munnAga izhuppadhan munnam” (the followers of yama, who do not have any finesse in their actions, will drive the soul as if they are driving oxen; they will drag the soul upside down with their ropes)! vadi sangam koNdAnai – one who has the sharp SrI pAnchajanyam (divine conch) on his divine hand. Do we need to talk about its sharpness since it is a weapon! Or, if we take the sound emanating from the conch as referring to its sharpness, then we can say that this talks about the greatness of conch whose sound can kill the enemies. Has it not been mentioned in SrI bhagavath gIthA 1-19 “sa ghOshO dhArthrAshtrANAm hrudhayAni vyadhArayath” (the sound of krishNa’s conch tore the hearts of dhrutharAshtra’s sons). Or, we can construe that the word vadi also refers to its beauty. In other words, one who has the beautiful conch in his divine hand. 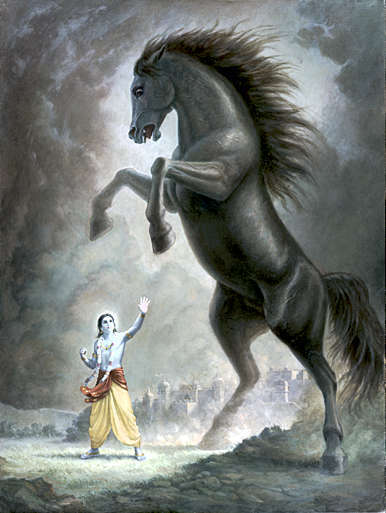 kUndhal vAy kINdAnai – one who tore the mouth of the demon kESi who came in the form of a horse. Horse is referred to us kUndhalmA [animal with hair]. Since horse has hair on the nape of its neck, it is referred to as kUndhal. kongai nanju uNdAnai – one who killed pUthanA. emperumAn killed kESi in later years while he killed pUthanA as an infant. Isn’t destroying enemies a natural act for him! EththuminO uRRu – think of him through your heart and praise him with your mouth. After knowing that hell is horrible, if you worship him who removes enemies, he will remove the hurdle ‘hell’ for us. kadidhu kodu naragam – wasn’t even dharmaputhra [yudhishtra] bewildered after seeing hell! We shall move on to the 94th pAsuram. This entry was posted in iraNdAm thiruvandhAdhi, iyaRpA on February 10, 2018 by T N Krishnan. AzhwAr says that if we attain him, we will get all the benefits. He says that we have to attain him not only for not going to hell [as mentioned in the previous pAsuram], but also for getting desired benefits. adiyAl – emperumAn stamped on kamsa’s chest with his divine feet. adiyAl – he jumped on kamsa with his beautiful, divine feet. He had to keep his divine feet on his enemy kamsa when he should have kept them elsewhere [refers to keeping them on soft, fragrant lotus flower]. 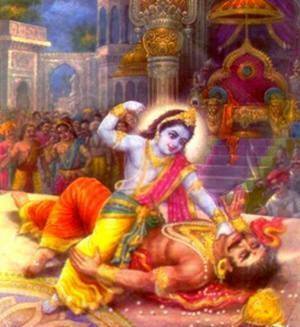 mun kanjanaich cheRRu – he sought out kamsa who wanted to cheat him and did to him what kamsa wanted to do to him [i.e. killed him]. amamrar Eththum padiyAn – since kamsa was killed, dhEvas such as brahmA et al were very happy that they had got back their tenements and praised emperumAn. Weren’t they the ones who lost their possessions because of kamsa! kodi mEl puL koNdAn – he has a flag only for protecting others. kodi mEl puL koNdAn – he is said to have periya thiruvadi (garuda) on his flag. Isn’t emperumAn the one who has a unique identification for himself with one who came and attained him! nediyAn than nAmamE EththumingaL – recite the divine names of one who has a deep memory and who will not ever forget us even if we recite his names just once and forget. Isn’t he the one who said in mahAbhAratham uththara kANdam 47-22 “gOvindhEthi yadhAgrandhath krishNa mAm dhUravAsinam ruNam pravrudhdhamivamE hrudhayAnnApasarppathi” (the cry-out of dhraupadhi when she called “gOvindha!” when I was very far away, has not left my heart even after so many years, and remains as interest on interest for a debt taken)! nediyAn can also mean supreme being. EththinAL thAm vENdum kAmamE kAttum kadidhu – it will grant you all your wishes. It will give you everything including removing your hurdles, wealth, kaivalyam (soul enjoying itself) and emperumAn himself . kadidhu – unlike worshipping other deities where the benefit will come much delayed, here the benefit will be granted immediately. kadidhu could also mean ”worship him immediately”. We shall take up the 93rd pAsuram next. This entry was posted in iraNdAm thiruvandhAdhi, iyaRpA on February 9, 2018 by T N Krishnan. AzhwAr says that once a person has subordinated himself to prakruthi (primordial matter; here it refers to samsAram, the materialistic realm), it is not possible to avoid narakam (hell) once the AthmA leaves the body. Hence he tells us to make an effort to worship emperumAn. He says, keep your head on the divine feet of emperumAn and your feet on the head of yama. pEdhuRuvIr – Oh people, who are bewildered! pinnAl aru naragam sErAmal pEdhuRuvIr – naragam (hell) is waiting to cause suffering once the soul leaves the body. This world is already giving sorrows. pEdhuRuvIr – Oh people who are indulging in evil deeds, ignorant of the impending sorrow, and now being bewildered out of repentance! munnAl vaNanga muyalminO – you cannot postpone this any further. You have to do it immediately. First worship emperumAn and then carry on with any other work. Instead of giving excuses such as “We are children; we can do it later; we are young, what is the urgency now? we have become old, what is the use of doing it now?”, take a moment, decide, and even if it leads to a fracture of your limbs, go and fall at the feet of emperumAn. Just as vibhIshaNa hurriedly went, as mentioned in SrI rAmAyaNam yudhdha kANdam 17-1 “AjagAma muhUrthEna yathra rAmas sa lakshmaNa:” (he hurriedly reached the place where SrI rAma and lakshmaNa were together), go immediately and fall at the divine feet of emperumAn. Is there any authentic source of information to reach him like this? pannUl aLandhAnai – he is confirmed in many sacred texts as the supreme being. He is attempted to be known through the collection of words. Has it not been said in SrI bhagavath gIthA 15-15 “vEdhaiScha sarvairahamEva vEdhya:” (only I am known through all the vEdhas (sacred texts)) and in yajur AraNya 3-11 “sarvE vEdhA: yathraikam bhavanthi” (in whom all the vEdhas confluence together)! kAr kadal sUzh gyAlaththai ellAm – all the earth surrounded by dark coloured ocean. gyAlaththai ellAm aLandhAn – There is no need to search for vEdhas to know that he is the lord of all the worlds. It can be known from the fact that he is ruling all these worlds. aLandhAn – because you were asked to attempt [to fall at this feet], don’t wonder whether it should be done; do it. Since he did not shun anyone when he measured the worlds, not shunning [him] is what is required now also. sEvadi – just as an infant seeks the bosom of its mother, go and worship his divine feet. Is it required to pay for mother’s milk? Drinking mother’s milk itself is the wage for the mother. Otherwise, will not the relationship between the mother and the infant become false? pEdhuRuvIr – Is there any point in being fearful now, after carrying out all the sinful deeds? We shall take up the 92nd pAsuram next. This entry was posted in iraNdAm thiruvandhAdhi, iyaRpA on February 8, 2018 by T N Krishnan. emperumAn asks AzhwAr “you are saying that I have killed kamsan; I have killed kuvalayApIdam etc. You are only talking about my activities. What is it that you want? Say that.”. AzhwAr says “Have I not received all the benefits!”. maN ulagam ALEnE – can I not administer this leelA vibhUthi (materialistic realm) under my control! mEvEnE – will I not enjoy great joy, comfortably! mannulagam ALEnE – if one takes a step towards emperumAn, is ruling the earth a great task? Have I not got that too! 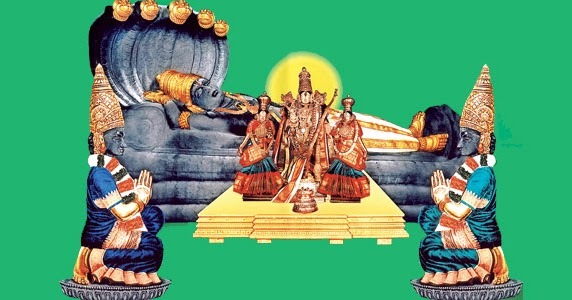 vAnavarkkum vAnavanAy viNNulagam thannagaththu mEvEnE – is being the head of nithyasUris and being in SrIvaikuNtam a great task? Have I not got that too! vAnavarkkum vAnavanAy – I will be as much greater than nithyasUris as nithyasUris are greater than samsAris. mEvEnE – just as SrI rAma gave his sandals to SrI bharathAzhwAn and asked him to look after the kingdom, I too got SrIvaikuNtam! Will SrIvaikuNtanAtha not give his divine feet and grace us to be like him! Just as nammAzhwAr had mercifully stated in thiruvAimozhi 4-3-11 “vaiyam manni vIRRirundhu viNNumALvar maNNUdE”, will emperumAn not make the two vibhUthis (nithya vibhUthi and leelA vibhUthi) mine! hanuman had mentioned in SrI rAmAyaNam yudhdha kANdam 116-24 “arthaScha mayA prApthA dhEvarAjyAdhayO guNA: hatha Sathrum vijayinam rAmam paSyAmi susthitham” (after seeing the victorious SrI rAma who had annihilated the enemies, all great things including the world of dhEvas have been obtained by me). In the same way AzhwAr too mentions that he has got both vibhUthis. vAnavarkkum vAnavanAy – for the word vAnavar instead of nithyasUris, one can also construe dhEvas such as brahmA et al and we can consider the meaning as AzhwAr saying that he got all the wealth such as brahmA et al. thirumAlaich chengaN nediyAnai engaL perumAnaik kai thozhudha pin – After approaching emperumAn, who is the consort of SrI mahAlakshmi, emperumAn who has the quality of motherly forbearance and emperumAn who is our Lord, and worshipping him with joined palms, is there any shortcoming in happiness and mOksham (SrIvaikuNtam)? Aren’t all these things present in emperumAn himself? thirumAlai – did I approach brahmAchAri (celibate) emperumAn? Did I not approach thirumAL (consort of SrI mahAlakshmi)? sem kaN nediyAnai – one who looks at those who worship him with lot of affection. Is emperumAn not of the type mentioned in mahAbhAratham uththara parvam 47-22 “gOvindhEthi yadhAgrandhath krishNa mAm dhUravAsinam ruNam pravrudhdhamiva mE hrudhayAnnApasarpathi” (the calling out of dhraupadhi from afar towards me did not leave my heart and was like a debt which kept increasing with interest over interest)! engaL perumAnai – did I attain a place which is not apt for me? Did I not approach emperumAn who is very much related to me! Just as it is mentioned in SaraNagathi gadhyam “asman swAmin”, is he not our swAmy (lord)? kai thozhudha pin – isn’t it true that both the vibhUthis become ours after worshipping him with joined palms! We will take up the 91st pAsuram next. This entry was posted in iraNdAm thiruvandhAdhi, iyaRpA on February 7, 2018 by T N Krishnan. emperumAn asks AzhwAr “Have I helped anyone who has held on to me, for you to say like this?” to which AzhwAr responds “Haven’t you done so?”. AzhwAr says how the karmas (deeds, both good and bad) of those who hold on to him disappear. He tells about the way emperumAn carries out activities for his followers and how he removes their enemies. maN koNdilaiyE – did you not obtain earth? adhavip pOr yAnai osiththu – breaking the tusks of the elephant, incapacitating it. 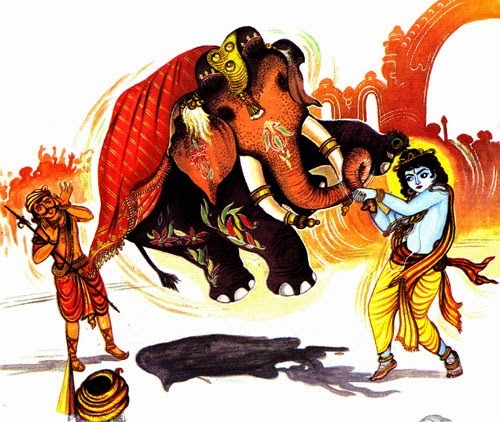 krishNa kept dodging the elephant and drove it such that the elephant became tired and he pulled out its tusks without any effort. This was done to help vasudhEva and dhEvaki. padhaviyAy – being very simple. Since you [emperumAn], despite having so much strength, saw a good quality in mahAbali. Alternatively the word padhaviyAy can be construed as – unlike killing kamsan, emperumAn honourably let mahAbali to live. paNdoru kAl mANiyAyk koNdilaiyE maN – did you accept it as a gift such that your wealth (greatness) showed? Did you not accept the gift as a bachelor, manifesting the quality of seeking alms! It appeared as if your hands had got scarred by accepting alms continuously. Even as emperumAn left SrIvaikuNtam for his incarnation as vAmana, he kept thinking about seeking alms. pANiyAl nIrERRup paNdorukAl mAvaliyai mANiyAyk koNidilaiyE maN – with the hand which you had used only for giving to others, you accepted the water which mahAbali offered [as a sign of giving what emperumAn sought]. Once upon a time when mahAbali had vowed only to give, did you not obtain earth as alms with the hands which had got scarred by accepting alms? AzhwAr is asking whether he did not put an end to the enemy of indhra who had attained him. We shall take up the 90th pAsuram next. This entry was posted in iraNdAm thiruvandhAdhi, iyaRpA on February 6, 2018 by T N Krishnan.